Happy Year of the Rooster Chinese New Year! 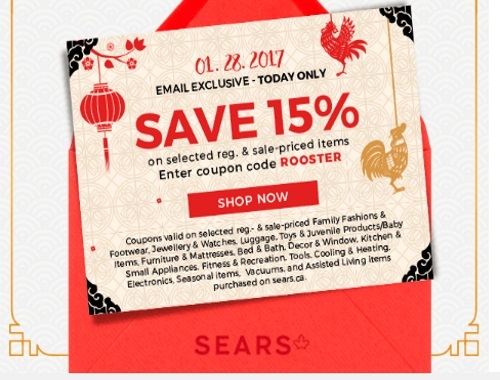 Sears has a special exclusive promo code just for today! Save 15% off on selected regular and sale priced items! Excludes items with prices ending in .94, .91, .88 and .97, Clearance, Daily Deals, and Canada's Best items. Also excludes Cosmetics, Fragrances & Grooming, Major Appliances (except heating & cooling items), Outdoor Power Equipment, Garage Door Openers, Gladiator. Panasonic, Magic Bullet, SodaStream, Nespresso, Keurig, DionoT, Nuna, Medela, KidCoT, HALO Bassinets, Dyson, iRobot, Miele, Rug Doctor, Miz Mooz, Pajar, Santana Canada, Report Collection®, Gift Card purchases, deferral or installment billing fees, protection agreements, delivery, installation and maintenance charges. Not negotiable, transferrable or redeemable for cash. On approved credit. Offer not valid on purchases made in store or from catalogue. One coupon per purchase; cannot be combined with any other coupon code. Offer ends January 28, 2017, at 11:59 p.m. ET. Enter the promo code ROOSTER at checkout. Offer is valid today only, January 28, 2017.